Research indicates that 37 percent of vehicles sold in the United States have a sunroof. A sunroof is a nice amenity that admits ventilation and light on a warm, sunny day. It is a great feature to have when enjoying a nice fall or spring afternoon or when taking a long trip to new places. When your vehicle’s sunroof is damaged or suddenly malfunctions, the overhead opening can allow rain to enter the passenger compartment if it is stuck in the open position. Vandalism, collisions, falling objects and other mishaps can easily damage these glass panels. 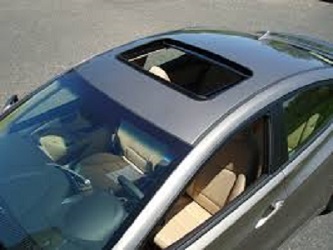 The average cost to replace a manual pop-up sunroof ranges from approximately $250 to as high as $750. This includes parts and labor. The make and model of the vehicle will also affect the cost because of any special requirements or modifications needed to make the sunroof fit and operate correctly. A top-mount spoiler sunroof features a glass panel that tilts and slides along the outside of the vehicle’s roof. Depending on the vehicle, size and materials, this type of sunroof typically costs between $700 and $1,200 to replace, including parts and installation. Another popular version is a moonroof, which includes a power-operated sliding glass panel that slides on rail installed between the vehicle’s metal roof and interior headliner. The most popular type of sunroof installed on new may cars is also the most expensive to replace. Replacement costs start at a $1,000 and can run as high as $2,000. We at Macs Auto Glass offer affordable on site sunroof repairs for all cars and trucks. We will come to you. Before looking to try to repair the sunroof yourself or using an auto repair shop or car dealership, let us give you a quote. Please call us at 251 228-2744, we are always ready to help with any auto glass needs, windshield leaks, and sunroof repairs. Also please visit our website at www.macsautoglassal.com to learn more about us.